I wrote a post a few months back where I mentioned my top podcasts at the time. Since then I’ve discovered more podcasts and I’ll be mentioning my favourite podcast episodes. I bought speakers this year so I could listen to podcasts while I’m cooking. I struggled to listen to podcasts without speakers in the kitchen because the sound of water running from the kitchen tap prevented me from hearing my podcasts. Buying the speakers helped me realise that my interest in podcasts was real. The podcasts I enjoyed are written in no particular order of preference. Melanin Millenials podcast episode on homelessness in Britain: It’s hosted by two black British women, Imrie and Satia. This episode got me thinking about housing and what the government can do to address this. They mentioned how the government is intending to spend £370m to refurbish Buckingham Palace while the homeless lie on the streets with nowhere to sleep. The Startup Podcast: It’s a podcast on business and entrepreneurship. I like the storytelling on the podcast. My favourite episodes from Startup were the series of episodes that followed the life of Dov Charney, the founder of American Apparel. He went from starting a great company to being fired by the company board. The episodes explored the mistakes he made such as having sexual relationships with his employees and his style of running a business. I walked past the American Apparel in Nottingham, where I live and saw that it was closing down. The first thing that came to my mind was Dov Charney has left the company and I wonder what’s become of American Apparel. Beyond podcasts, I’ve read more books this year from non-fiction to romance literature. It was hard for me to choose my favourite books this years but I ended up choosing two. It’s a book that explores what happens when there is no gun control. The book looks at the lives of ten young people who died from gun wounds on a particular day in America. Each chapter focuses on one young person who was killed by a gun and tells the story on the life that they lived. The Book of Harlan falls into the historical fiction genre. It is set in the period from 1917 to about the late 1960s. Harlan is a young black musician who is caught up in Europe during the Nazi era and ends up in a concentration camp. The book opens with the birth of Harlan in Georgia and follows the experiences of his family move from Georgia in other parts of America in search of a better life. Both Another Day in the Death of America and The Book of Harlan were set in America and explored the lives of minorities within the country. I understood more about the black experience in America. Previously, I didn’t understand much about the Black Lives Matter protests and the books let me know why these protests matter. Both books didn’t specifically mention Black Lives Matter but their themes on violence and race can be linked to the protests. Have a lovely new year. Let me know what your favourite books or podcasts were this year and what you’re looking forward to reading in the new year. This entry was posted in Books, Podcasts on December 31, 2016 by Tunrayo. Listening to podcasts reminds me of listening to the radio. The major difference being that anyone can start a podcast while being on air at a radio station involves formal procedures. There was a time I wanted to delete the podcasts app on my phone because I never used it but I was unable to. The podcasts app is in-built on my phone. I started listening to podcasts when I realised that some bloggers behind the blogs I read had podcasts. 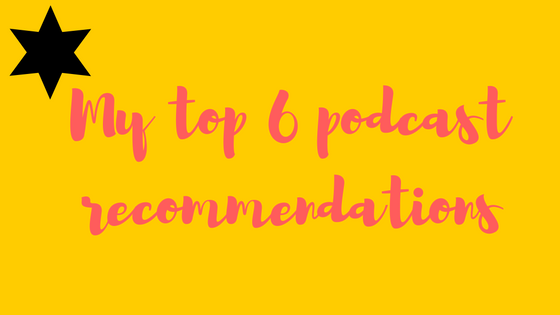 Today, I decided to share six of my favourite podcasts. 1) This Afropolitan Life: It is hosted by Clarissa Bannor, a Ghanaian-American. I discovered her podcast while reading one of her articles on She Leads Africa. She included her site in her bio on the platform. I checked it out and saw that she interviewed an actress from a web series I love, An African City. The actress she interviewed was Maame Adjei and I listened to it. From then, I’ve been a regular listener to Clarissa’s podcasts. She focuses on the stories and experiences of Africans both in the diaspora and on the continent. One of my favourite episodes was on weddings. She had an events planner, Maame on the show and they spoke about planning an African wedding. Maame mentioned how brides would see something pretty on Instagram and would only want to pay $500 for that beautiful thing they saw on Insta. If you want the fancy decor you saw on Pinterest, you have to pay for it. Clarissa is vegan and she had an episode on being vegan and African. One of Clarissa’s friends was on the podcast and she’s vegan too. It was interesting to hear what it’s like being vegan in a household where all your family members are eating jollof rice (which has meat stock) and fried fish at a family gathering. 2) The Pool: They have episodes such as Dear Viv which is like an agony aunty show. People send in questions like- what happens when you move in with your homeowner boyfriend and you break up. They also interview authors so I listen to them for book recommendations. They interviewed Kit de Waal, the author of My Name is Leon and immediately I was sold on reading her book. It’s on my Goodreads list now. It’s a book about a boy who is mixed race and comes from a poor family. The story explores how it can be difficult for young black boys to be adopted. Leon has a younger half- brother who is white and he got adopted but Leon wasn’t. 3) The Pandolly Podcast: This is a popular culture, fashion and entertainment podcast hosted by two British ladies, Pandora Sykes and Dolly Alderton. It’s the Sunday Times Style podcast. On one of the podcasts, they spoke how much they had stalked a wedding on social media. Then, they saw one of the guests at that wedding in real life and they were about to say hello. They then realised that they didn’t know the guest.However, because they had looked at the wedding pictures a lot, they felt for a moment that they knew the guest. Dolly and Pandora are interesting to listen to so check them out. 4) Ctrl Alt Delete: This is hosted by Emma Gannon, who is a British blogger, author and podcaster. Her podcast has the same name as her book. I think that was a brilliant marketing strategy as the name of her book sticks quickly in people’s mind once you begin to listen to her. She has had popular YouTubers- Zoella and Tanya Burr as guests on her podcast. It’s interesting how social media has shaped people’s careers and lives. My little cousin once told me, he wants to be a YouTuber. Social media has changed our aspirations and Emma talks about how lives are different now that we are online a lot more. 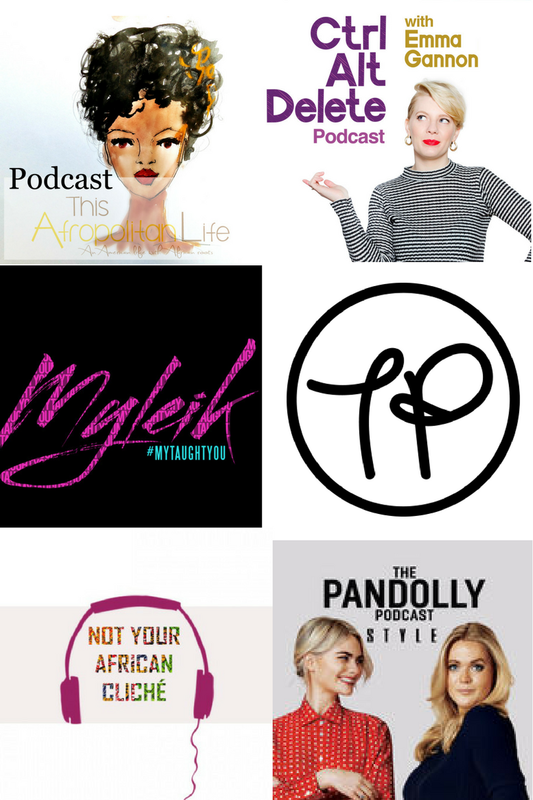 6) MyTaughtYou: This is hosted by Myleik Teele, who is the founder of Curlbox, a beauty subscription service in the US. Myleik is really down to earth and she says it as it is. She answers questions from listeners and shares her experiences as an entrepreneur in the natural haircare industry. I like that she not only runs Curlbox but she connects with people in a different way through running her podcast. In all, podcasts allow me to discover the world in a different way. One minute, I’m listening to a podcast about weddings and the next minute I’m listening to a podcast on whether Pippa Middleton is a socialite or not. I like stories so I think that’s part of the reason why I love podcasts. Do let me know in the comments if you listen to podcasts and which ones you recommend. Photo Credit: This Afropolitan Life, Emma Gannon, Myleik, The Pool, The Pandolly Podcast and Not Your African Cliche. This entry was posted in Entertainment, Podcasts on September 28, 2016 by Tunrayo.